Nature reserves have a vital role for protecting biodiversity and its many functions. However, there is often insufficient information available to determine where to most effectively invest conservation efforts to prevent future extinctions, or which species may be left out of conservation actions entirely. To help address these issues, Map of Life, in collaboration with Google Earth Engine, has now pre-released a new service to pinpoint at-risk species and where in the world that they occur. 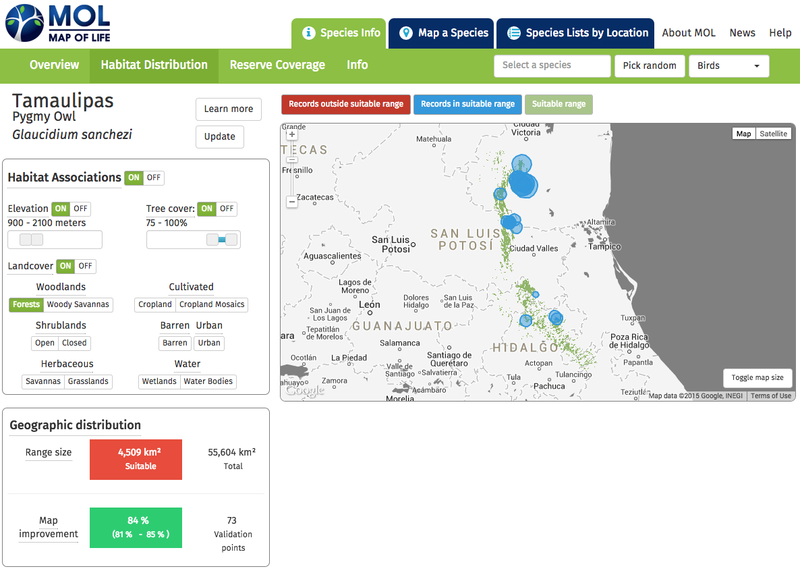 At the fingertips of regional naturalists, conservation groups, resource managers and global threat assessors, the tool has the potential to help identify and close key information gaps and highlight species of greatest concern. Left: Tamaulipas Pygmy Owl (Glaucidium sanchezi, photo credit: Adam Kent). Right: Map of Life consensus range map showing the potentially habitable range of this species. But accounting for available habitat in the area using remotely sensed information presents a different picture: less than 10% of this range are forested and at the suitable elevation. Users can change the habitat association settings and explore on-the-fly how this affects the distribution and map quality. This refined range map now allows a much improved evaluation of the owl’s potential protection. Furthermore, the sensitivity of conservation assessments to various assumptions can be directly explored in this tool. The owl’s potential protection is likely to occur in only around 1,000 km2 that are under formal protection, representing seven reserves of which only two have greater than 100 km2 area. This is much less than would be desirable for a species with this small a global range. Another species example, the Hildegard’s Tomb Bat, is similarly concerning: less than 6,000 km2 of suitable range remains for this forest specialist in East Africa, with less than half currently under protection. 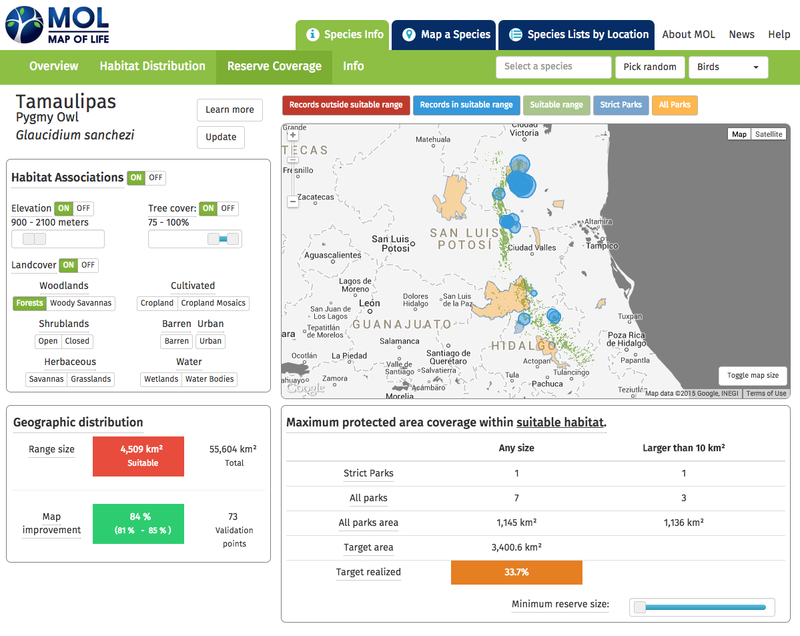 A demonstration of this tool for 15 example species was pre-released at the decadal World Parks Congress in Sydney Australia last November to the global community of conservation scientists and practitioners. In the coming months this interactive evaluation will be expanded to thousands more species, providing a valuable resource to aid in global conservation efforts. For more information and updates, follow Map of Life.